Not sure why on the first card, it shows the compact-custom-header at top and bottom of first column… and if I click on edit for the second one, it opens up the GUI editor for the card? actually I do know why… somehow I had it on that column at the top and the bottom. All good! @mayker great job, card works great!!! just one question is there any tracker.json url for we be able to use with tracker card, custom updater? He specifically said it has been removed TEMPORARILY from the custom tracker - presumably because of the major breaking changes. David is correct, the card was removed temporarily. Also, a tracker.json file & URL is not needed for this project as it is included in custom-updater by default. Expect it to be back up there next week. Do I understand it correctly if I think I have to have - type: custom:compact-custom-header in every view, but only do the config in the view where I set the main_config option to true, when I’m in yaml mode? This is great i downloaded the new version and done the config and it works really well . You’re absolutely sure that the username is correct, the user is logged in, and there are no special characters in the name? 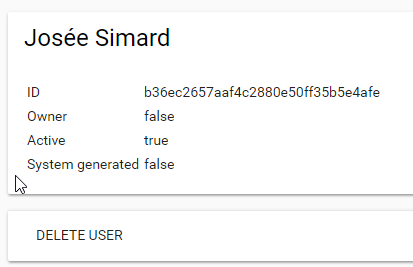 I only use usernames for my user’s, but I guess if you assign them full names then that’s what hass reports. Glad we figured it out. Questions, is it possible to disable the “compact header” part without disabling everything else? Not currently, you should add it to the feature requests on the github. in a Firefox (ver. 65) console. In Chrome everything works OK.